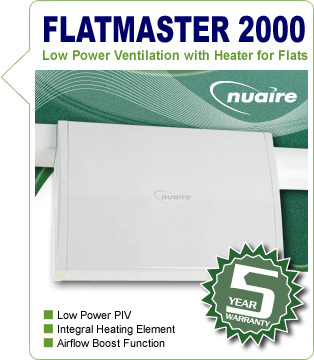 The Nuaire Flatmaster 2000 is a low cost 'whole house' ventilation system with an integral heater designed for flats, apartments, properties with no loft space or properties with an unvented loft space. This unit includes a small heater to lift the temperature of the supply air in Winter. Without it the supply air will be outdoor air temperature. The Flatmaster 2000 Positive Input Ventilation (PIV) unit saves energy, removes dust, mould and odours, at the same time reducing condensation. PLEASE NOTE: To install this unit we recommend employing a local electrician, as the trickiest job is normally connecting it to a fused outlet or other power source. The unit requires standard 4" (100mm) ducting which is readily available from high street DIY stores. How does the Flatmaster PIV work? The Flatmaster is an effective low cost solution to high condensation issues within flats, apartments and properties with no loft space. The positive input ventilation unit gently supplies fresh, filtered air into a home through a duct connected to outdoors. By slightly increasing the indoor air pressure the stale air inside the property is effectively 'pushed' out through gaps in the building fabric and trickle vents if fitted. Unlike standard loft mounted PIV units the Flatmaster is designed to be wall hung inside the property. The physical unit is therefore more compact and designed to fit flush to the wall. Fresh air is pulled into the unit via either 100mm round ducting or 121x60mm box ducting connected to atmosphere, then fed into a central location within the property such as the hallway. Positive input ventilation has been clinically proven to help allergy and asthma sufferers by effectively removing high quantities of dust and particules from the air within your home. PIV units also help reduce and maintain radon gas levels. Solarcrest will provide technical support to any competent DIYer, local builder, electrician or plumber. Sadly we no longer offer a national install service for this product. PLEASE NOTE - The above price excludes any ducting required to connect the unit to an exterior grille and/or indoor air diffuser. Unlike many PIV units the air filters inside the Flatmaster only require an inspection and clean every 1-2 years, normally with a vacuum cleaner and/or a hand wash. More frequent inspection post-building work is prudent as the filters are likely to pick up more dust than normal. Other than the filter inspection the PIV is a fit and forget item. All Nuaire units come with a 5 year warranty for added peace of mind.